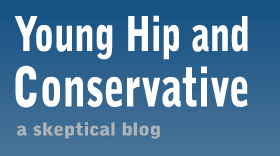 Young, Hip and Conservative: a skeptical blog: Can we stop calling it racial profiling yet? Now that enough of the the Henry Louis Gates Jr. 911 call has been released to rule out any race-based motives for the original police response, can we stop framing this as a race issue? With that in mind, a quick review of the Gates case reveals race was just a coincidence, and the charge of racial profiling is a non-sequitur. The racial profiling charge says that after Gates found himself locked out of his house and broke in through the back, police were motivated by his dark skin to consider him a likely burglar and investigated. Finding nothing, Cambridge police got into an argument with him and used a disorderly conduct charge out of spite and to show their power. This view follows the left's view on race, but it doesn't follow reality very well. -A neighbor spotted Gates and another man force their way into the back of the house. She told police dispatch it may be a break in, or they may be locked out. -Police are dispatched to the house and find Gates inside. -The story becomes public and the charges against Gates are dropped. The police didn't know the man in the house would be black until they arrived. A brash, rude civilian has a good chance of being arrested by police, regardless of their race. It's tautology to say that Gates was arrested because of racism, and the way we know racism was a factor is because Gates was black. The burden of evidence, which is on the people claiming racism is a factor, hasn't been met. Racial profiling is completely out the window. Gates' race wasn't known until police had already arrived. Any firm conclusions of demonstrated racism are unsupported by evidence and therefore are impossible to separate from coincidence.